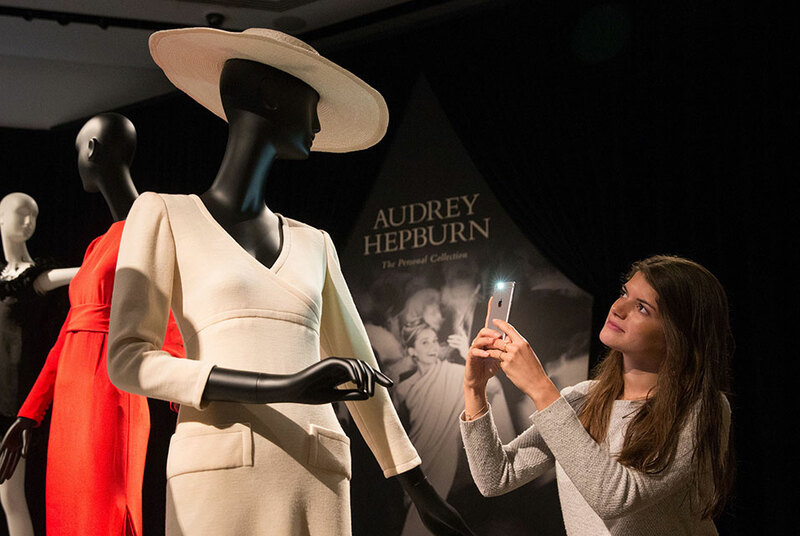 An employee poses alongside a display of outfits during a preview of Audrey Hepburn's personal collection at Christie's auction house in central London on September 22, 2017. Daniel LEAL-OLIVAS / AFP. LONDON (AFP).- Film scripts, dresses and other treasures from late film legend Audrey Hepburn's Swiss attic are going up for sale in London at an auction that offers a remarkable insight into her personal world. "My mother kept it in the attic, quite literally," Hepburn's son Luca Dotti told AFP at a viewing of the more than 500 lots at Christie's auction house ahead of the sale next week. "My mother was not a collector but she kept every little bits and pieces for sentimental reasons". An array of luggage being sold off includes a battered black-lacquered suitcase she is believed to have arrived in London with to take up a ballet scholarship in 1948, before she became one of the world's most famous actresses. The working script for the 1961 film "Breakfast at Tiffany's", including deleted scenes, is another rarity being sold along with numerous other scripts featuring Hepburn's hand-written notes. Glamorous dresses by designers including Givenchy and Valentino -- which her son Sean Hepburn-Ferrer noted few would fit into -- have been put on display alongside playful clothing including a 1964 Spanish matador outfit. Hepburn was born in Belgium on May 4, 1929 and moved to the Netherlands with her family after the outbreak of World War II. They went hungry for months during the way while on the run from Nazi troops. She made her film debut in 1948, playing an air stewardess in "Dutch in Seven Lessons", an educational travel film, and moved to London later that year to seek her fortune. Hepburn had her first starring role in "Roman Holiday" (1953), playing a European princess who falls in love with Gregory Peck as an American journalist. She married American actor Mel Ferrer in 1954. They divorced in 1968, the same year that she met her second husband, Italian psychiatrist Andrea Dotti, on a Mediterranean cruise. She died in Switzerland in 1993 at the age of 63. The film star's family said they chose to keep a number of items like her collection of awards, including the Oscar statuette she won for "Roman Holiday". Other items were also too sentimental to sell, including family photos from Hepburn's childhood. "I'm particularly fond of the beginnings.Her life before becoming Audrey Hepburn," Dotti said. But the collection does include some more personal pieces such as "My Garden Flowers" -- a 1969 artwork by Hepburn that she painted while pregnant with Dotti. The sale also includes her American cine camera, pointing to the actress's interest in also documenting life from the other side of the camera. Adrian Hume-Sayer, Christie's director of private collections, said the sale was "pretty extensive". "There's lots of little personal things," he said, pointing to the telephones from her house in Switzerland and a make-up case monogrammed with her initials. He said the "backbone" of the sale was the annotated film scripts, adding that the collection as a whole had been carefully put together to "tell a story".